Gainford Drama Club”s spring performance led the audience on a dizzy dash over six decades as characters tried their hardest to stop a double murder. 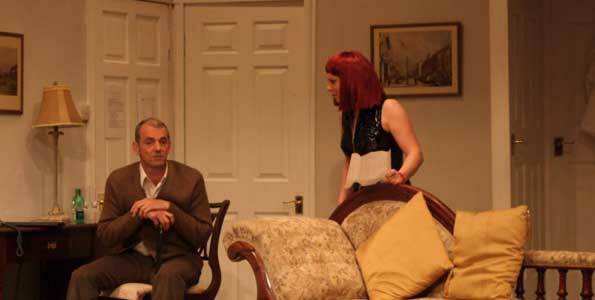 Communicating Doors, by Alan Ayckbourn, moves between 2014, 1994 and 1974. Set in a hotel suite, the characters find themselves travelling through time every time they pass through a door which they think connects to another room. The small cast of six keep the action ticking along nicely and the two main protagonists, Poopay and Ruella, work well together. Poopay, a prostitute who accidentally gets caught up in the 60-year murder mystery, is excellently played by Claire Bell, while Jan Richardson-Wilde gives an admirable performance as Ruella. Reece, played by Lawrence Chandler, is at the centre of the love-trangle, but takes a back seat as the women dash between decades to make sure the creepy Julian (Chris Allcock) does not carry out the double murder. Lauren Wheeldon is good as the dizzy would-be murder victim Jessica, while hotel security guard Harold (Paul Richardson) is equally as dim. On the whole, the pace was well maintained, though forgotten lines put the brakes on the action far too often. The audience responded particularly to the well-choreographed slapstick moments, particularly when, as the play reached its climax, three women were left dangling out of the hotel window.